Lemongrass (Cymbopogon Citratus) other names: Andropogon citratus, Andropogon flexuosus, British Indian Lemongrass, Capim-Cidrao, Ceylon Citronella Grass, Citronella, Citronnelle, Citronnelle de Ceylan, Citronnelle des Indes, Citronnelle de Java, Citronnelle de Madagascar, Cochin Lemongrass, Cymbopogon citratus, Cymbopogon flexuosus, Cymbopogon nardis, East Indian Lemongrass, Fever Grass, Guatemala Lemongrass, Herbe Citron, Hierba de Limón, Jonc Odorant, Lemon Grass, Madagascar Lemongrass, Verveine Indienne, West Indian Lemongrass. Cymbopogon citratus, generally known as lemongrass, is a resourceful herb, a natural source of aroma, mosquito repellent as well as a plant that is widely used to decorate gardens. Lemongrass belongs to the grass or Poaceae family (formerly known as Gramineae) and has several functions - an effective herb, aromatic or container garden, or as a medication for various conditions. One may find a number of variety of lemongrass and each of them possessing dissimilar chemical compositions. However, citral is the major chemical ingredient found in all varieties of essential oils of lemongrass. Lemongrass is native to tropical regions and grows in clusters. The plant has globular stems that eventually become leaf blades. This herb belongs to the herb family which also includes citronella and palma-rosa and possesses a lemon essence. When the leaves of the lemongrass are compressed they release the aroma of lemon. The lemongrass is a perennial plant with brawny stalks and somewhat broad and scented leaves. This species of plant is usually cultivated commercially for oil refinement and is different by its individual aroma and chemical composition of the oil. Apart from C. citratus, or Cymbopogon citratus, there are other varieties of lemongrass such as C. nardus (also known citronella grass that is a source of citronella oil), C. martini (known as ginger grass, palma-rosa or rusha) and C. winterianus (Java citronella oil). 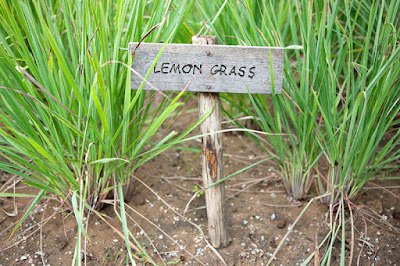 Lemongrass is also a resourceful plant in the garden. This grass, native of the tropical regions, usually grows in thick bunches that often develop to a height of six feet (1.8 meters) and approximately four feet (1.2 meters) in breadth. The leaves of the lemongrass are similar to straps and are 0.5 inch to 1 inch (1.3 cm to 2.5 cm) in width and around three feet (0.9 meter) in length, and possess stylish apexes. The lemongrass bears leaves round the year and they are vivid bluish-green and when mashed they emit an aroma akin to lemons. The leaves of lemongrass are used for flavoring and also in the manufacture of medications. The leaves are refined by steam to obtain lemongrass oil - an old substitute in the perfume manufacturers' array of aroma. The most common type of lemongrass found is a variety of plants that originated and persisted under cultivation and do not usually bear flowers. Over the years, lemongrass has fast turned out to be the most wanted plant for the American gardeners and this is attributed to the increasing popularity of Thai culinary in the United States. The aromatic lemongrass is considered to be of multi-purpose use in the kitchen as it is used in teas, drinks, herbal medications and the soups and delicacies originated in the Eastern region of the world and now popular all over. In fact, the worth of this aromatic and cosmetic plant was known to the ancient Greeks, Romans and Egyptians. For hundreds of years, lemongrass has been a resource of natural aromatic oil that is primarily used in the manufacture of perfumes, adding essence as well as in the preparation of herbal medications. It is advisable to store some quantity of lemongrass in the house so that you may include a lemon lime essence to your ice tea and even put some zing to beat the fries. In order to collect the lemongrass, plow a cluster of the plant, divide the segments, and separate the roots and the tops maintaining around six inches (15 cm) of the pale hued plant base. Cymbopogon nardus, a member a relative of lemongrass, is a fine resource of citronella oil, a substance that offers a special aroma (and also a strike), and is, therefore, widely used as a mosquito repellent. It is important to mention here that when candles enclosing the Citronella oil are lighted, hardly any mosquito ventures near and even if they do, none of them survive the strong scent. Presently candles made with Citronella are becoming increasingly popular for their ability to ‘naturally' control the mosquito menace and it is advisable that you may also have some of them at your terrace. Lemongrass is native to tropical Asian countries like Sri Lanka and India where lemongrass grows in abundance. While lemongrass grows naturally in tropical grasslands, lemongrass is also widely cultivated in all the tropical regions of Asia for commercial purpose. Presently, lemongrass is cultivated as a cash crop in different parts of the globe. Lemongrass is used for treating digestive tract spasms, stomachache, high blood pressure, convulsions, pain, vomiting, cough, achy joints (rheumatism), fever, the common cold, and exhaustion. Lemongrass is also used to kill germs and as a mild astringent. Apart from the herb's aromatic, ornamental and culinary uses, lemongrass also provides a number of therapeutic benefits. Lemongrass leaves and the essential oils extracted from them are utilized to cure grouchy conditions, nervous disorders, colds and weariness. It may be mentioned here that many massage oils and aromatherapy oils available in the market enclose lemongrass oil as an important ingredient. The essential oils extracted from lemongrass have a yellow or yellowish-brown hue and this liquid is known to be antiseptic. Very often the oil is applied externally to treat disorders like athlete's foot (tinea pedia). 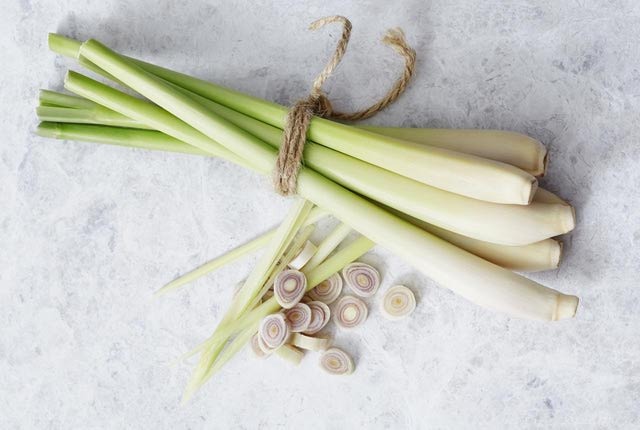 Among other things, lemongrass is also used as a carminative to emit digestive gas, a digestive tonic, a febrifuge or analgesic as well as an antifungal. In addition, lemongrass is prescribed to treat rheumatism and sprains, suppress coughs, and as a diuretic and sedative. The stalks and leaves of the lemongrass are widely used in culinary in different Asian countries. The leaves and essential oils of the plant are also utilized in herbal medications. In addition, lemongrass is extensively used by the cosmetic industry in the manufacture of soaps as well as hair care products. Finally, these days, lemongrass is being appreciated for its effectiveness in repelling mosquitoes. The essential oils of Cymbopogon species are basically used in the fragrance industry as they possess very restrained therapeutic uses. Many gardeners in the sub-tropical climes grow lemongrass in the beds and borders with a view to decorate their plots. When planted along the walkways, lemongrass plants release a pleasant aroma when swept against by the passers-by creating wonderful environs. The lemongrass also thrives well in tubs and containers. It is advisable to grow the plants in pots during the winter months and maintain them in vibrantly illuminated indoor areas. People residing in the frosty areas are able to enjoy the aromatic plant throughout the year. As discussed earlier, lemongrass forms an important ingredient in Oriental cooking as this superb lemon-aromatic is a culinary delight. In fact, the lemongrass constitutes an essential element of the Vietnamese and Thai culinary as it reveals a satisfying essence to soups, sauces, curries and fish dishes. Additionally, a stimulating tea can also be prepared with lemongrass. 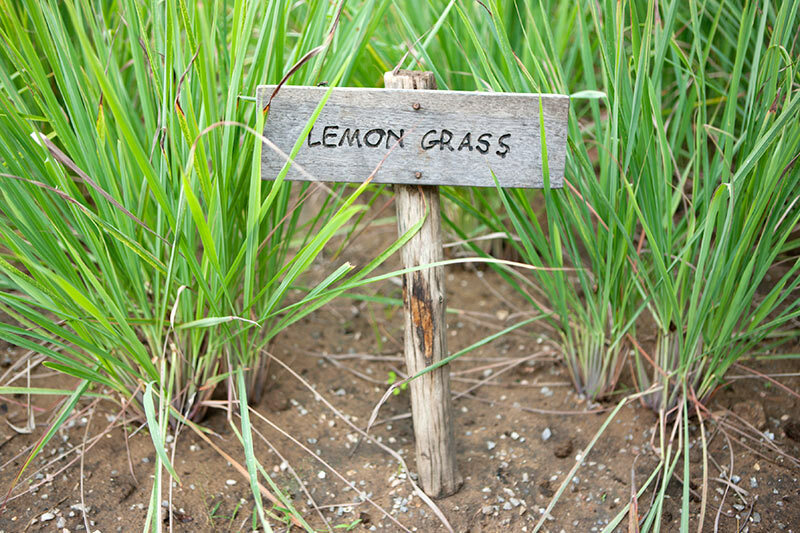 Chefs in Thailand and Vietnam use lemongrass stalks to provide a lemon-like essence to their dishes. In fact, they only use the youngest part of the stems - usually 6 cm to 7 cm from the base of the plant. The process includes removing the outer leaves of the plant and cutting off both ends of the stem using the middle portion. While cooking with lemongrass stems, they should be cut into relatively longer pieces so that it is easier to remove them after the dish is prepared. Cooks in China, Indonesia and Malaya use the dehydrated lemongrass leaves in the preparation of marinades for grilled meat and fish. On the other hand, French chefs use fresh lemongrass in some of their culinary. It may be mentioned here that lemongrass gels well with coconut, garlic, ginger, shallots and chili pepper. Lemongrass is likely safe for most people when used in food amounts. Lemongrass is possibly safe when taken by mouth or applied to the skin short-term for medicinal purposes. However, there have been some toxic side effects, such as lung problems after inhaling lemongrass and a fatal poisoning after a child swallowed a lemongrass oil-based insect repellent. Pregnancy and breast-feeding: It is likely unsafe to take lemongrass by mouth during pregnancy. Lemongrass seems to be able to start menstrual flow, so there is a concern that lemongrass might cause a miscarriage. There is not enough reliable information about the safety of taking lemongrass if you are pregnant or breast-feeding. Stay on the safe side and avoid use.